Mark H. Metcalf is a former judge on the immigration court in Miami, Fla. Under President George W. Bush he served in several posts at the Justice and Defense Departments. American immigration courts are the heart of a system that nurtures scandal. Their work touches nearly every aspect of America’s immigration system. These courts are essential to recruit the bright and talented to American shores, to alleviate persecution, and to secure this nation’s borders and neighborhoods. But they cannot perform their critical work. Deception and disorder rule. These courts have become — in the words of frustrated judges — “play courts.” In reality, they are courts that are built to fail. Very few aliens who file lawsuits to remain in the United States are deported, even though immigration courts — after years of litigation — order them removed. Deportation orders are rarely enforced, even against aliens who skip court or ignore orders to leave the United States. Aliens evade immigration courts more often than accused felons evade state courts. Unlike accused felons, aliens who skip court are rarely caught. From 1996 through 2009, the United States allowed 1.9 million aliens to remain free before trial and 770,000 of them — 40 percent of the total — vanished. Nearly one million deportation orders were issued to this group — 78 percent of these orders were handed down for court evasion. From 2002 through 2006 — in the shadow of 9/11 — 50 percent of all aliens free pending trial disappeared. Court numbers show 360,199 aliens out of 713,974 dodged court. For years, the Department of Justice (DoJ) has grossly understated the number of aliens who evade court. In 2005 and 2006, DoJ said 39 percent of aliens missed court. Actually, 59 percent of aliens — aliens remaining free before trial — never showed. Since 1996, failures of aliens to appear in court have never dipped below 30 percent. Immigration judges cannot enforce their own orders. Department of Homeland Security (DHS) officials may order alien offenders arrested and deported. Immigration judges — the system’s sole judicial officers — have no such authority. Judges seldom know if their orders are enforced. No single federal agency is exclusively tasked with enforcement of removal orders. Immigration and Customs Enforcement (ICE) executes removal orders only when its enforcement strategy says so, not — as it should — in obedience to court orders. ICE’s enforcement strategy does not mention immigration courts or deportation orders. Enforcement of deportation orders is now nearly non-existent. Removal orders are not enforced unless aliens have committed serious crimes. Unexecuted removal orders are growing. As of 2002, 602,000 deportation orders had not been enforced. Since then, another 507,551 have been added to the rolls. Today, unexecuted removal orders number approximately 1,109,551 — an 84 percent increase since 2002. U.S. immigration courts rule in favor of aliens 60 percent of the time. DoJ suggests aliens win 20 percent of the time. The Department of Justice tells Congress that aliens appeal deportation orders only 8 percent of the time. In fact, over the last 10 years aliens appealed deportation orders 98 percent of the time. Since 1990, immigration court budgets have increased 823 percent with taxpayers footing the entire bill. Aliens pay no more to file their cases today than they did in 1990. From 2000 through 2007, tax dollars — slightly more than $30 million — paid aliens’ court costs. Taxpayers underwrote the appeals of aliens ordered removed for criminal convictions and fraudulent marriages. U.S. immigration judges carry huge caseloads. In 2006 — the courts’ busiest year ever — 233 judges completed 407,487 matters. All work of DoJ’s trial and appellate lawyers combined equaled only 289,316. By comparison, federal district and circuit courts, with 1,271 judges, completed 414,375 matters. Aliens face the real prospect of not receiving a fair trial. DoJ’s attorney discipline scheme — a scheme applicable only to the alien’s lawyer — denies aliens the right to effective assistance of counsel and fair trial. The only possible way the Justice Department’s misrepresentations will be corrected is for the Government Accountability Office (GAO) to audit America’s immigration courts. An Article I court — a court created through Congress’s constitutional authority over immigration — is the surest solution for those fleeing persecution, while balancing America’s fundamental interest in secure borders and an effective immigration system. America’s immigration courts are built to fail. Their authority is weak and their accountability weaker. Their annual reports to Congress — reports offered as a candid summary of court business — are simply dishonest. Bland language and twisted numbers — “government speak” — substitute for unblinking candor and reliable statistics. Court records are reported so badly as to mislead or, worse yet, not reported at all. As a result, America is penalized — and so are the millions of immigrants whose fates have rested with government officials who refuse to tell America the straight story about these very American courts and their very American business. America is shortchanged by the one institution of the federal government charged with telling the truth about these courts — the U.S. Department of Justice. America is more than shortchanged. It is, in fact, cheated. Immigration is vital to America and its immigration courts express fundamental confidence in those who embrace our shores and a steadfast faith in our democratic traditions. It is a confidence that pluralism, free enterprise, and rule of law are redemptive.1 They are redemptive because they bestow the most priceless gift a nation can confer upon its people — in a word, self-determination.2 Self-determination tempered by order and liberty defines the American experience.3 America’s immigration courts are essential to this experience. They bring to a single point the vaulting ideals and hard-boiled pragmatism that lie — and should lie — at the core of America’s immigration system.4 Their story, though, is untold. Deception and disorder reign. Deception is found in numbers that distort more than just yearly reports to Congress. Phony numbers cloak the courts’ absent authority — and absent authority, more than anything else, defines these tribunals. Absent authority is the common thread running through every piece of the courts’ work. Absent authority equals enfeebled judges, no-show litigants, unenforced orders, errant removals, listless caseloads, tardy relief, at-risk American neighborhoods, and compromised national security. Absent judicial authority means disorder and this disorder encourages the illegal immigration to America that overshadows the singular, positive role immigration has played and still plays in this nation that accepts more legal immigrants to its shores each year than all nations of the world combined.5 Immigration — one of America’s most powerful dynamics — is unmatched by courts of equal strength. Weakness is supreme and its impact is pervasive. Put simply, feeble courts cannot enforce their own judgments.6 Deportation orders are ignored and few aliens — aliens ordered removed after years of litigation — are ever deported.7 And what follows from this feebleness is nothing less than predictable. Courts unable to execute deportation orders are incapable of speeding relief to the worthy when bureaucrats falter. Courts without resources — chiefly agencies that will execute their orders8 — cannot pursue rule of law. Courts, in effect, are not courts at all. They can neither impose order nor protect liberty. Absent authority signals frailty and frailty invites calculation. The man who skips court or disobeys an order to leave the United States does so knowing that the court that can order him removed9 cannot enforce its judgment.10 A 1989 GAO report found “[a]liens have nothing to lose by failing to appear for hearings and, in effect, ignoring the deportation process.”11 Disregard for the courts, the study concluded, stemmed from a “lack of repercussions” — in other words, no consequences — because few aliens are actually deported.12 In 2003, DoJ’s Inspector General reached the same conclusion. He found no more than 3 percent of asylum seekers ordered deported were actually removed.13 Even after federal circuit courts of appeal yearly affirm deportation verdicts by the thousands, the same aliens remain in the United States because DHS is no better at enforcing the orders of federal appellate courts than it is of immigration trial courts.14 But time also plays a major role. The man who overstays a visa can predict his lawsuit to stay in the United States — a lawsuit called an application for relief — will take years to finish, even though his trial took less than three hours.15 The 1989 GAO report found that by avoiding deportation, aliens “prolong their stay in the United States” and “establish roots” that may prove beneficial.16 “Roots” like marriages started during deportation proceedings or children conceived after illegal entry — children sometimes called “anchor babies” — are just two examples. Even if their bids to remain in America fail, both men know that removal seldom occurs,17 and, in the end, neither is removed. One lies low, the other waits on the courts, and both avoid enforcement — enforcement that in all likelihood will never arrive anyway. If there is one truism that directs those who enter the United States illegally, it is this: find a way in. Thousands of deaths along America’s borders and beaches are tragic evidence of this maxim. This maxim has a corollary and it is this: once in, find a way to stay. Court evasion and marriage fraud18 are ready proof of this imperative and the risks it creates for American security. Headlines tell the story. More precisely, those who violate America’s immigration laws do so deliberately. Just over 1.1 million deportation orders — orders issued against those who evaded court or disobeyed orders to leave — remain unenforced.31 Nearly half the illegal alien population in the United States — out of some 12 million persons — overstayed their visas.32 And because these “overstayers” cannot be located, rarely are they brought to court.33 Even when they are, few are deported.34 In the end, more is gained from violation of law than obedience to court orders, international borders, or visas. “[A]s long as the benefits of illegally immigrating outweigh the costs,” Temple Law School’s Jan Ting, observes, “the influx will continue.”35 All these problems are rooted in a Justice Department that cannot square with the American public about these courts and the chaos left in their wake. From beginning to end this enormous problem is created, aided, and abetted by the Justice Department. The Department of Justice manages America’s immigration courts. Judges work for the Attorney General.36 Through the Executive Office for Immigration Review — better known as EOIR, the DoJ agency responsible for the courts — Congress is supposed to learn how these tribunals perform. But EOIR reveals little and what it reveals is largely inaccurate. Agency reports mock transparency. The full picture of large and complex caseloads goes undeveloped. Candor that yields understanding fails. Practical reforms go unproposed because critical statistics are falsely stated, skewed, or omitted. Making matters worse, judges seldom know if any orders they issue — orders granting relief to aliens or those ordering removal — are ever enforced.37 From its beginning in 1983 through today, EOIR has adopted no mechanisms to match its courts’ removal orders with actual deportations.38 The seamless relationship that should characterize the courts’ relationship with immigration enforcement agencies is totally nonexistent. The courts’ yearly accounting is a farce. Numbers are absent for all cases filed, adjudicated, appealed, granted, denied, transferred, and withdrawn. Only reports on asylum cases come close to transparency and even these lack completeness. As to most cases the courts hear, DoJ reveals only one thing: grants of relief — judgments favoring aliens. Nearly everything else is hidden, muted, or left out. What EOIR offers in its annual reports are at best shallow audits of court business and this shallowness — the hallmark of mendacity — adds up in big ways. It is not benign. Shallow audits deceive. They deny to Congress information essential to understanding courts that demand more in tax dollars each year, yet refuse a truthful accounting of their record. Their reports lull lawmakers and the public alike into believing the courts are effective when the opposite is true. This shallowness is not limited to caseloads, though. It extends to the most aggravating problem that judges confront on a daily basis — failures to appear in court. Failure of aliens to appear in court — DoJ’s label for court evasions — is the largest problem of all. The problem is two-fold. First is the fact of evasion — a scandal by itself. Second is the way EOIR reports it — an even worse scandal. EOIR masks the problem and reports numbers unsupported by even the most generous scrutiny. When Mark Twain wrote “[T]here are three kinds of lies: lies, damned lies, and statistics,” he was kidding — but he also knew something of statistics or at least those who author them.39 The way EOIR reports court evasions only proves Twain’s adage — and worsens the problem. Contrary to Justice Department reports, aliens routinely evade court and in great numbers.40 Nearly 800,000 aliens fled court between 1996 and 2009.41 They failed to appear in court after receiving their summons42 or, after answering charges, simply vanished. Others received removal orders — orders they said they would appeal — and walked from courtrooms never to be seen again. Then there are those who have fully litigated their cases through trial and appeal, have been ordered removed, and continue living here disobedient to the same laws they claimed they would obey. All are proof that weak courts and weaker accounting corrode a system intended to dignify litigants and give confidence to an increasingly skeptical public. The present system fails both and hides these failures behind numbers and phrases that disclose little and stifle inquiry even more. Deception and disorder rule along with their co-equal partner: unaccountability. In 2005 and 2006, for example, EOIR told Congress the “overall failure” of aliens to appear in court was 39 percent, surely a bad number in any court system. Scrutiny reveals 59 percent — nearly three-fifths of all aliens free pending trial in those years — evaded court.43 Since 1996, failure-to-appear rates have never dipped below 30 percent of those free pending trial.44 No other group disobeyed orders to appear in court because no other group could. The only other group was in detention — and its members made their court dates. The term historically used by DoJ — “overall failure to appear” — mischaracterizes litigants, aliens all, as court-dodgers, when, in fact, only one part of one group evaded court — those who were free before trial. It is this group that EOIR obscures from critical examination. Instead of transparency, EOIR games the numbers and accountability becomes as much a casualty as candor and order. To get the lower figure, EOIR lumped together two very different groups — another way of saying it mixed apples with oranges. EOIR combined aliens free pending trial with those detained pending trial — and, in turn, dramatically reduced failure to appear rates. Because detained aliens, essentially aliens in jail, always attended court and outnumbered aliens who failed to appear, evasion rates seemed much lower. This practice — the practice of merging different groups and reporting numbers that looked better — was not a one-time thing. The same practice has distorted the court’s work across everything it does. Distortion, in fact, is not exceptional with these courts. It is routine. It began in 1996 and continues today. From 1996 through 2009, the United States permitted 1.9 million aliens to remain free pending trial.45 Forty percent of this group never showed for court.46 From this same group nearly one million aliens were ordered deported — and 78 percent of these orders were against those who evaded court.47 Absent numbers and misleading numbers — numbers from an agency claiming an important role for the courts in national security48 — hid from Congress the disorder befalling America’s immigration courts at a time in American history when the need for accurate reporting could not have been greater. EOIR’s own words admit the urgency that existed then and still exists — an urgency its executives set aside in favor of statistics that buried disturbing figures beneath soft graphs and friendly numbers. Official-looking government reports belied the hard reality of a court system in disarray with its senior leadership in denial. “The fight against terrorism,” EOIR said in 2008, “is the first and overriding priority of the Department of Justice …. The application and enforcement of our immigration laws remain a critical element of this national effort” and “EOIR remains an important function [with regard to] … enforcement.”49 From 2005 through 2009, EOIR — using the same language — justified itself and the courts’ budget to lawmakers.50 Surely national security, if not counter-terrorism, requires the same vigilance,51 but as annual reports show, EOIR’s actions never matched its words. It said one thing and did another — all the while telling Congress that immigration courts are the “frontline presence” in immigration enforcement.52 Year after year, court records show EOIR filed false reports and failed the high calling of federal service. The linkage between aliens who flee court and unenforced removal orders is clear — and clearly unreported by the Justice Department. In fact, DoJ’s own regulations — regulations driving a wedge between the courts and law enforcement — aggravate the problem. “Once an alien has been ordered removed,” EOIR states, “DHS is charged with executing removal.”57 By regulation — not by statute — DoJ refuses to monitor its judges’ orders, still claiming a contradictory “frontline presence” in enforcement and shifting any perceived failure in enforcement over to DHS. DoJ does other things, too, that cannot be reconciled with vigilant courts and alert enforcement. Never has the Justice Department admitted that aliens failed to appear in court more than 39 percent of the time.58 From 1996 through 2009, the courts issued 2.3 million removal orders. Of these, 1.1 million orders — nearly 48 percent — remain unenforced today and the vast majority of them are against aliens allowed to remain free during and after trial.59 At no time did DoJ or EOIR sound alarm at these evasions. Never did DoJ or EOIR ask Congress for more authority to control alien conduct. Never did DoJ or EOIR offer specifics. How many of these orders, for instance, involved aliens whose criminal convictions brought on deportation rulings? How many concerned those who entered fraudulent marriages? How many orders are against those who skipped court? How many are orders against those who overstayed their visas? How many were issued against those whose urgent pleas for sanctuary placed them in expedited asylum proceedings? On all these questions, court reports are silent. This pattern of non-disclosure — through even greater distortion — continues to this day. The courts’ 2009 report is proof. For 2009, EOIR told Congress that failures to appear in court dropped to historically low levels60 — that only 11 percent of alien litigants failed to keep their court dates.61 In fact, 32 percent of aliens free pending court evaded their hearings.62 EOIR reported a figure nearly three-times lower than the actual number. To obtain this number, EOIR excluded a whole category of cases — cases it had disclosed for the last 13 years — and again included the two different groups of aliens its accounting had mixed together for 13 years. Throwing together aliens held in detention who came to court with aliens outside detention who often skipped court and dropping from calculations those aliens whose court misses resulted in their cases being administratively closed63 caused 2009 court evasions to “decline.” Without this numerical sleight of hand, failures to appear in court would not have decreased. They would have remained right where they were prior to 9/11 — when 30 percent to 38 percent of aliens evaded their court dates.64 They would also have remained consistent with evasion rates in 2007 and 2008, when as many as 38 percent of aliens free pending court ignored orders to appear before a judge. By fudging its numbers, EOIR has for years claimed evasion rates that honest accounting does not support. Never in any year did EOIR do the right thing and compare only those aliens who were free pending trial and tell Congress how many out of this group disobeyed orders to appear in court. Instead, it whitewashed these numbers — along with others that it omitted. And what it omits, it leaves to guess work. EOIR routinely reports how many applications or lawsuits aliens file each year in order to defend against deportation. In 2009, EOIR said the courts completed 69,442 applications.65 Nowhere in its 2009 report — or any other year — did EOIR account for all these applications. Asylum applications totaled 39,279, and the courts actually completed 5,551 more asylum cases than were filed by finishing some from prior years,66 for a total of 44,830 asylum claims actually decided one way or another.67 But EOIR says nothing about the 24,612 cases that made up the balance of the 69,442 lawsuits that were completed.68 EOIR never mentions this total or what became of the cases that compose it. This is the way this agency has reported the courts’ business since 1996. Rather than a full accounting, EOIR yearly defaults to numbers which “improve” only by manipulation, not by better performance or superior processes. In short, EOIR’s yearly reports are a sham — a pretense of candid audit. Accuracy, credibility, relevance, and timeliness elude this agency and the flow of believable statistics to the public — a flow EOIR not only controls, but authors — is more than hindered. Its reports fail the narrow purpose of describing the courts to lawmakers and the broader one of informing the public. The story of America’s immigration courts is hidden beneath details that blur a compelling story of national purpose and the disappointing one that demands change — the kind of change found only in a democracy. It is change that honors litigants with a court that delivers on its promise of justice.71 For even those immigrants who play by the rules — and observe in trusting silence as others break them — find these rules at odds with reason and fairness.72 “All you ever hear about,” declares one observer, “is the issue of amnesty for illegal aliens. Meanwhile, the legal aliens in the queue — those who dot all the I’s and cross all the T’s — are lost in the shuffle.”73 It is also change that assures the American public that its institutions of justice work and that their work is faithfully reported. Finally, it is change that tackles problems known for years that have been just as knowingly neglected by those in charge. Laws written decades ago have little relevance to present caseloads.74 Aliens convicted of minor offenses in the past are called to court years after leading productive lives without blemish.75 Harmless scuffles and non-violent offenses — matters disposed with little difficulty decades before in state and municipal courts — place otherwise solid residents, young and old, in deportation proceedings.76 Other flaws are equally corrosive. Under present law, courts have only two alternatives to address any case: relief — a decision favoring an alien — or removal — an order directing an alien to leave the United States. Courts are overcome by caseloads demanding more powerful and sentient tools the Immigration and Nationality Act (INA) presently denies them. Remedies that allow courts to suspend the harshness — and in some cases the laxity — of the INA are absent. Remedies proportionate to the seriousness of offenses are needed. Sanctions that remove offenders and under the right facts offer redemptive solutions are the answer to the blunt alternates of relief and removal.77 Vesting judges with this authority has other benefits as well. Empowered courts balance the relationship with DHS. Immigration courts are less than weak compared to this powerful police agency. No clearer example of this is found than in the inability of judges to enforce removal orders against those who skipped court or ignored deportation rulings. These orders are rarely enforced.78 Instead, they are executed at the discretion of DHS. Put differently, non-judicial officials determine whether judicial orders are enforced — not the judges who issue them.79 This practice turns the courts and enforcement upside down, making judges secondary to a police agency and barely a footnote to their own judgments. This topsy-turvy failure shows that aliens who disobey court orders are treated remarkably better than the general public in other courts across the United States. In any other court, disobedience to court orders results in arrest, contempt, and incarceration. Not so in immigration courts. Rarely, if at all, are aliens held accountable for the same conduct that would place a citizen in jail. In immigration courts, upside down is routine — as routine as annual reports that masquerade as truth. That the courts have been typecast as openly hostile or bigoted then is no surprise. EOIR’s numbers and narratives suggest courts seldom grant relief and that removal orders typify the courts. To create this impression, EOIR did what it nearly always does. It mixed apples with oranges. EOIR compared these 295,617 favorable decisions — decisions coming from lawsuits defending against deportation — to all decisions made by the courts, those with and without lawsuits. With comparisons like this, grant rates were bound to appear extremely low and, as accurate numbers reveal, the truth is something else entirely. In the last 10 years, trial courts made decisions in 2,124,022 cases, but only 486,032 of these decisions involved suits in which aliens defended against deportation efforts.86 In other words, 1,637,990 aliens filed no lawsuits — in fact, did not seek to remain in the United States — and in nearly every case consented to removal. When the 295,617 cases that received favorable judgments are compared to 2,124,022 decisions made from 2000 through 2009, rulings that favored aliens were a bare 13.9 percent of all verdicts. It is EOIR’s comparing dissimilar cases — combining cases in which aliens opposed removal by filing lawsuits with cases in which aliens consented to removal — that drives down the percentage of favorable judgments. The critical distinction — the distinction EOIR never makes — is the difference between cases that have applications (lawsuits opposing deportation) and those without applications. What EOIR never tells Congress or the public is that only cases with applications can potentially receive favorable judgments and only cases with applications can potentially be appealed. Without applications — without lawsuits seeking relief from removal efforts — there cannot be judgments favoring aliens and there cannot be appeals in the event these applications are denied. EOIR’s same apples and oranges math that buries accurate numbers enabled EOIR to tell Congress that appellate rates are low — only 8 percent in 2009.90 Scrutiny shows just how untrue this is. Since 2000, 98 percent of all removal orders involving aliens who filed suits to remain in the United States were appealed.91 This lone statistic shows that aliens with applications for relief appeal deportation orders nearly all the time, while the courts’ annual reports state the exact opposite.92 Never in any year did EOIR report that appellate rates exceeded 17 percent.93 Applications like asylum, adjustment of status, and cancellation of removal, all of them suits that defend against deportation, enable aliens to file appeals when deportation verdicts are issued. EOIR’s statements to Congress — statements that declare “[o]nly a relatively small percentage of immigration judge decisions are appealed to the [Board of Immigration Appeals] BIA” — are simply not credible.94 They are — as are so many of EOIR’s statements — deceptive. Since 2000, aliens appealed 214,404 out of 218,589 removal orders coming directly from lawsuits they had filed to remain in the United States. Despite the absolute importance of these numbers in understanding immigration courts and the people whose cases they judge, they were never shared with Congress. EOIR misrepresented trial and appellate decisions in the same way it misrepresented how frequently aliens evade court. And it did it the same way. What EOIR does is under-report appellate rates by including cases that cannot be appealed in the first place, while telling Congress with the straightest of bureaucratic faces that appellate rates are low, when, in fact, they are high — very high. Much like calculating failure-to-appear rates based largely on those who always appear in court anyway, this loose math gives a false impression that is never corrected. Call it bad bookkeeping, call it poor thinking, or call it gaming the numbers. Whatever the label, this practice shields the courts from critical analysis and delivers unreliable numbers to the public. Other practices lead to other failures that loom just as large. Since only cases with applications can later be appealed, it is these cases — and a history of non-enforcement of their removal orders — that prompt closer scrutiny. Applications reveal an alien’s place of residence, his employment and the identities of family members — family members the alien often lives with. When an alien’s application is denied and he is ordered removed, actual removal, despite abundant information about him, seldom occurs. It does not comfort the American public either. In 2003, DoJ’s inspector general reported the “INS [now DHS] [is] ineffective at removing nondetained aliens.” INS removed only 13 percent of non-detained aliens in general,99 but, even worse, INS deported only 6 percent of non-detained aliens from countries that sponsor terrorism.100 When citizens and non-citizens in other American courts must obey court orders at the risk of contempt for not doing so — certain that these courts will act — the upside-down nature of immigration courts and their inability to enforce their orders becomes clear. America’s immigration court system is failing and the smoke screens EOIR lays down with its annual reports each year abet this failure. Add to the number of criminal aliens detained aliens who consent to removal102 and those aliens who — after arrest at border crossings — waive their right to any hearings and return to their home countries voluntarily.103 Plainly, though, aliens passing through immigration courts — even those who fled court or refused to leave when ordered — are not removed. Rule of law is nowhere to be found. When ICE says it focuses enforcement on criminal aliens, its totals never reflect how many non-criminal aliens with removal orders are carried on its books. This is the same neglect that has produced more than a million unexecuted removal orders that DHS has never owned up to. For 2010, ICE even admitted that it did not remove a portion of those it claimed to have deported — those, in fact, that deported themselves by “voluntarily” departing.108 Taken altogether, it was no surprise when ICE agents on June 25, 2010, voted “no confidence” in the political leadership now running the agency. Citing these appointees’ “abandonment [of ICE’s] core mission of protecting the public,” agents warned that criminal aliens were often released by ICE — for the same offenses for which American citizens would often stand trial and go to prison — and that the American public was at risk.109 For appearance’s sake, and nothing more, this agency reports glowing totals with little substance. Enforcement is a mirage. In reality, the urgent mission of both the courts and law enforcement is defeated by excuses wholly at odds with an enforcement strategy that removes actual violators and deters those tempted to skirt federal law. The practical means to impose obedience to court orders are used with success in state and federal courts across the United States every day but are ignored by DHS and DoJ in favor of policies that continue to allow nearly a third of aliens free pending trial to abscond every year. The refusal to enforce removal orders looks past these examples of enforcement and encourages the same conduct that would land both citizens and non-citizens in jail in any other court. In fact, In fact, the present system is not credible. No federal agency is exclusively tasked with enforcing deportation orders. What enforcement there is occurs through ICE, but ICE enforces orders only when the DHS interior enforcement strategy says so, not — as it should — in obedience to court orders.114 Since no language in the DHS enforcement strategy even mentions immigration courts or removal orders,115 removal orders are treated as recommendations. Under the Immigration and Nationality Act, DHS is sheriff, prosecutor, and jailer. All too often it is judge. This singular defect prompts frustrated judges to term their courts “play courts.”116 The concept of judicial imperative is largely unknown. Under the present system, judges can do nothing about these risks DHS invites and makes worse. Absent judicial authority places in the hands of non-judicial DHS officials decisions affecting not just American homes and threats from killers like Jose Alfaro in Manassas, Va., but entire American cities threatened by terrorists like Faisal Shahzad in New York. These are failures that only courts with authentic judicial authority can address. Courts are crippled by weakness that allows those who are suspect or those who are ordered removed to thumb their noses at federal authority or, worse yet, to attempt destruction of the land that trustingly gave them safe haven. There is, of course, more to this dysfunction. The weak courts that cannot move DHS to enforce deportation orders are equally hindered by steep caseloads that congest an already clogged system. To say things are sluggish would be a compliment. Getting any case to trial frequently takes more than a year.127 On average any case will lie pending 15 to 20 months.128 The life span of cases — cases that often take less than three hours to try129 — is often not less than five years and frequently is more.130 The fact that aliens who file lawsuits to remain in the United States appeal the verdicts they receive 98 percent of the time makes clear that not only trial courts, but also the Board of Immigration Appeals,131 the court of appeals for immigration cases, is choked by cases that take years to resolve. In 2003, EOIR reported trial courts carried a backlog of 161,000 cases.132 In 2008, the OMB (Office of Management and Budget),133 based on figures provided by EOIR, told the public the backlog had dwindled to 3,965 cases.134 Actually, more than 200,000 trial matters congested court calendars that EOIR said nothing about.135 A Syracuse University study revealed the deficit. Congress, the public, and presumably the White House had no inkling of this logjam.136 This congestion stretched back more than 11 years.137 Today the backlog exceeds 260,000 cases that EOIR never mentioned to Congress.138 Trial courts are not alone, however. Contrary to American Bar Association guidelines, the BIA fails to complete 95 percent of its appellate caseload from year to year — yet this is an improvement.139 In 2000, 23 appellate judges had 63,763 cases strangling their dockets.140 By 2002, nearly 58,000 cases had been pending up to five years.141 Today, eight years later, nearly 28,000 cases — just less than half the 2002 bottleneck — await judgment.142 Stasis has been standardized. More than just unmet deadlines are present here. Completing the balance is an American public that expects its courts to perform with the same precision and candor they must bring to their own households and businesses. Immigration courts, in critical respects, do neither. Nor does the fiscal management of the courts inspire confidence. Once more, things are turned on their head. “[O]ne can fairly ask … what incentive is there for the typical alien to appeal from an Immigration Judge’s decision? One part of the answer lies in the fact that the appeal filing fee is very low, $110. With that fee being waived by the BIA in about 50 percent of appeals, oftentimes even where an alien is represented by an attorney. The alien is not charged for copies of the record or for the transcript of the hearing, which often exceeds 50 pages. All of these costs are absorbed by EOIR. By contrast, to my knowledge, no-cost appeals on a civil level are a rarity. These flaws — disabled courts, no-show litigants, unenforced orders, endless backlogs, and poor fiscal management — belie other defects, defects of a constitutional nature. Aliens face the real potential of not receiving a fair trial. The Justice Department’s attorney discipline scheme, applicable only to the alien’s lawyer,149 denies to aliens the right to effective assistance of counsel and fair trial. Private counsel is exposed to public scrutiny of alleged misconduct while federal prosecutors are exempt from the same exacting standards.150 In effect, the alien’s attorney is openly put through a process that might suspend him from practice, while federal prosecutors accused of the same conduct enjoy the plush protections, including private proceedings, granted to federal employees. Private counsel have no such sanctuary. In effect, two very different processes apply to those attorneys who advocate on opposite sides of the same case. DoJ and EOIR argue these two very different processes are equivalent and do not violate the Fifth Amendment right to fair trial. Comparison reveals the gross inaccuracy of their argument.151 Because the alien’s attorney is treated substantially different, indeed less well, than the government’s attorney, the alien, too is treated in an unconstitutional manner. The potential chilling effect of such disparate treatment invites all the harms that follow when a supposedly “separate but equal” practice is imposed on any class — alien or citizen. Weak courts — courts that can discipline no one — are the cause of this unconstitutional imbalance. The Justice Department took its self-deception a step further, though. Years of aliens skipping court — aliens its own policies allowed to remain free — has never prompted it to give accurate numbers to Congress. Instead, the Justice Department hid them and continued the same policies that led to nearly 800,000 aliens failing to appear in court and over one million unenforced deportation orders. Never during this time has DoJ attempted any meaningful reforms. In the face of these disasters, DoJ’s path has never changed. It has remained passive and inert — filing yearly reports with Congress that are misleading at best and ignoring problems that even the most optimistic budget requests won’t make go way. This inertia is nothing less than the familiar failure of leadership and management153 and from this failure come broken courts and a dispirited American public. Rather than broker change that complemented immigration — change that pursued rule of law and, in turn, sustained popular support — the Justice Department has chosen the corrosive way out that continues today. It has defaulted to shoddy bookkeeping and the promise that adding more judges — judges without authority — will silence all but the most vocal critics.154 With such a course as this one, case backlogs will surely dwindle, while removal orders — orders that will never be enforced — will just as surely expand. In the end, the Justice Department and the courts it manages fail the American public they are intended to serve, the immigrants they are intended to elevate, and the suspects they are intended to sanction. But where there is failure, there is also opportunity. Rule-of-law solutions work in our rule-of-law nation. Indeed, the fates of people, the integrity of a court system, and the destiny of this nation depend on this most basic foundation. Judges who rule with fairness and firmness are no less critical to America today than they have ever been in our history. Authoritative immigration courts — courts unlike the ones America now invests in — are the answer. A reformed court, independent of the Justice Department, offers definitive, rule-of-law solutions. At issue is America’s security. At risk is America’s historic openness. At a disadvantage are America’s immigration courts. The “uniform Rule of Naturalization” mandated by the Constitution155 is impaired by disabled courts, which today cannot begin to approach the full measures of justice that are needed. Well within its power, Congress should authorize a court with authentic judicial authority — a real court.156 Its governing principle would be just ends, not temporal expedience or political gain. An independent Article I court is the platform for this rule of law solution — and indeed this platform has a strong foundation. America confronts a divide that strains the national fabric. Arguments on either side of these powerful issues push the American public toward division. In one America observes a direct refusal to enforce federal law going hand-in-hand with groups that advocate disobedience, invite disorder, and urge disunion.161 In the other, America confronts reaction that denies the positive role immigration has played and still plays in our national life.162 Both courses dim our shining example to the world. There is much here that needs repair. There is much here also that inspires. Order, liberty, and compassion define our laws and institutions. They should reaffirm America’s Immigration and Nationality Act in the tradition of inclusion. They should demand no more from the alien than is required of the citizen. A federal court that fully realizes the worthy ends this cornerstone of federal law embraces answers this call for reform — and reforms the courts now built to fail. Congress should replace the present immigration court system with an Article I court with presidentially appointed, Senate-approved, judges, similar to the U.S. Tax Court or the U.S. Court of Federal Claims. Trial and appellate judges would have continuing jurisdiction over the alien litigants and government agencies appearing before them. They would have authority to enforce their orders, using both legal and equitable remedies. Article I immigration courts should have both civil and criminal jurisdiction. Courts would continue to rule on asylum, adjustment, and cancellation cases — the bulk of their present caseloads. Their criminal caseload would involve violations of Titles 8 and 18 of the U.S. Code — alien smuggling, marriage fraud, document fraud, and false claims of citizenship. Concurrent jurisdiction with Article III courts would assure access to constitutional protections — grand jury and jury trial — for defendants who request them. These new, more expert immigration courts would swiftly rule on high volume matters that previously have choked their Article III counterparts. The courts’ annual reports to Congress — the “Statistical Year Books” — need reform. EOIR’s reporting methods misrepresent critical dynamics of court business. Failure-to-appear rates are significantly understated. Incomplete disclosure of trial caseloads is routine. Appellate caseloads are entirely unknown. Expedited asylum matters are not reported with fidelity to congressional intent. A frank audit by the GAO is needed. The Bureau of Justice Statistics and the National Research Council — both of them available to EOIR — should redesign its reporting methods. Transparency is itself a remedy for these ills. Filing fees and court costs merit significant revision. Fees have not increased since 1990, while taxpayer commitment to the courts has increased 823 percent. Court costs are non-existent. From 2000 through 2007, taxpayers provided just over $30 million to transcribe trial records for litigants, some of whom were convicted of crimes in the United States or had committed marriage fraud. Revising costs and fees in non-asylum cases only — and allowing the fees to remain with the courts — could produce a savings of $13 million. Intermediate remedies are needed. Immigration courts currently have available only two judgments to address any case they hear: relief or removal. Equitable remedies that give courts jurisdiction over aliens throughout the trial and appellate processes and offer redemptive solutions for those who merit second chances, with certain removal for those who do not, provide fuller justice the present courts cannot deliver. Constitutional defects impair alien litigants’ rights to effective assistance of counsel. This vital guarantee is denied by court regulations that create a dual disciplinary system that investigates, prosecutes, and sanctions only private counsel. DHS prosecutors cannot be held to account by either judges or EOIR for any alleged misconduct. This process is a product of weak courts — courts that cannot discipline either attorneys or litigants. An Article I court is the solution for this defect. 5 “Statement of Jan Ting to the National Commission on Terrorist Attacks Upon The United States,” December 8, 2003, www.9-11commission.gov/hearings/hearing6/witness_ting.htm. 6 Once an alien has been ordered removed by EOIR, DHS (through ICE and its sub-agency DRO (Detention and Removal Operations)) is charged with executing removal. See EOIR 2009 Year Book, p. B1, www.justice.gov/eoir/statspub/fy09syb.pdf. 7 Edward R. Grant, “Symposium on Immigration Appeals and Judicial Review,” Catholic University Law Review, 55 Cath.U.L.Rev. 923, p. 2, Summer 2006. 8 While federal district courts (Article III court under the Constitution) and, for example, the U.S. Tax Court (an Article I court under the Constitution) have Article II agencies (agencies controlled by the Executive) which enforce their orders, immigration courts have no such enforcement authority or Article II agencies to enforce their orders. 9 8 U.S.C. § 1101, et seq. Prior to the enactment of IIRIRA (Illegal Immigration Reform and Immigrant Responsibility Act of 1996), deportation, removal, and exclusion were distinct proceedings under the INA. Now all proceedings seeking to expel aliens from the U.S. are termed “removal” proceedings. Persons subject to removal include aliens in the U.S. illegally, aliens physically present but inadmissible, and persons who, after being legally admitted, committed crimes or other acts that render them removable. In short, deportation equals removal. If an alien defends himself from removal by claiming adjustment of status or cancellation, the case is heard by trial courts in “removal” — the name of the remedy that government prosecutors ask the trial court to impose. The courts’ annual reports never break out, for example, how many adjustment cases or how many cancellation cases courts hear each year. Likewise, alien appeals are never broken down by asylum, adjustment, or cancellation. There is, in fact, less transparency on appellate matters than on trial matters. 10 Once an alien has been ordered removed by EOIR, DHS (through ICE and its sub-agency DRO (Detention and Removal Operations)) is charged with executing removal. Courts cannot direct the execution of their own orders whether they grant relief to an alien or direct his deportation from the U.S. See EOIR 2008 Year Book, p. B1, www.justice.gov/eoir/statspub/fy08syb.pdf. 11 “Immigration Control: Deporting and Excluding Aliens from the United States,” p. 31, U.S. General Accounting Office, GAO/GGD-90-18, October 1989, archive.gao.gov/f0302/140072.pdf. 15 According to estimates from the Pew Hispanic Center, nearly half of all the unauthorized migrants now living in the United States — approximately 12 million — entered the country legally (usually with a visa) through a port of entry. At these ports of entry, such as an airport or a border-crossing point, they were subject to inspection by immigration officials. “Modes of Entry for the Unauthorized Migrant Population,” Pew Hispanic Center, May 22, 2006, pewhispanic.org/files/factsheets/19.pdf. 18 An Internet search using the term “marriage fraud” or “marriage fraud ring” reveals scores of investigations and prosecutions across the United States. Most marriages of foreign nationals to U.S. citizens are legitimate; still, marriage fraud is common. See Jim Leusner, “83 Arrested In Florida Sham-Marriage Probe,” Orlando Sun-Sentinel, May 10, 2008; Laura Butler, “12 Are Indicted In Marriage Fraud; Total Rises To 35,” September 29, 2010, www.kentucky.com/2010/09/29/1457115/12areindictedinmarriagefraud.html. 20 “Green card” simply refers to lawful permanent residence. A green card holder is a lawful permanent resident. 25 See Keith Alexander and Henri Cauvin, “Ingmar Guandique Convicted of First-Degree Murder of Former Intern Chandra Levy,” The Washington Post, November 23, 2010, www.washingtonpost.com/wp-dyn/content/article/2010/11/22/AR2010112203633... and see Emily Babay, “Ex-cellmate Says Guandique Admitted Killing Levy,” Washington Examiner, November 4, 2010, washingtonexaminer.com/local/2010/11/ex-cellmate-says-guandique-admitted-killing-levy (“Morales [the government’s witness against Guandique] said he and Guandique became friends because they were associated with allied gangs — Morales with the Fresno Bulldogs and Guandique with MS-13.”). 26 Matthew Barakat, “Man Charged With 3 Counts of Murder In Va. Attacks,” Associated Press, February 11, 2011, news.yahoo.com/s/ap/20110211/ap_on_re_us/us_manassas_shootings#mwpphucontainer. 31 U.S. Department of Justice, FY 2002 Performance and Accountability Report, Strategic Goal 5.2A, www.justice.gov/archive/ag/annualreports/ar2002/sg5finalacctpartone.html. “As of September 30, 2002, there was a 406,000 case backlog of removable unexecuted final orders and a 196,000 case backlog of not readily removable unexecuted final orders of removal, for a total of 602,000 unexecuted orders. [NOTE: Aliens “not readily removable” include those who are incarcerated, officially designated as in a Temporary Protected Status and those who are nationals of Laos, Vietnam, or Cuba (countries with whom the United States does not have repatriation agreements). ]” See also U.S. Immigration and Customs Enforcement, ICE Fiscal Year 2008 Annual Report, p. 4, www.ice.gov/doclib/news/library/reports/annual-report/2008annual-report.pdf. This report states that in 2008 “ICE arrested 34,155 fugitives, which is an increase of more than 12 percent over the previous year. This has led to a six percent reduction in the number of open fugitive alien cases from the beginning of the fiscal year with nearly 37,000 fugitive alien cases resolved. At the end of FY08, there were 557,762 such cases remaining.” A review of the courts’ history strongly suggests the number of unexecuted removal orders at the end of 2009 equaled 1,109,551 and that unexecuted removal orders are much greater than ICE admits. Adding together the number of removal orders from 2003 through 2009 — orders which the 2003 IG report and ICE’s own 2008 report suggests remain unenforced — shows the United States added 541,867 removal orders to the 602,000 that remained unexecuted as of 2002. From 2003 through 2009, non-detained aliens ordered removed each year respectively were 70,002 in 2003, 69,720 in 2004, 132,099 in 2005, 126,545 in 2006, 54,552 in 2007, 48,398 in 2008, and 40,551 in 2009. For verification, see EOIR 2004 Year Book, p. D2, www.justice.gov/eoir/statspub/fy04syb and EOIR 2009 Year Book, p. D2, www.justice.gov/eoir/statspub/fy09syb.pdf. The figure 1,109,551 assumes a 3 percent removal rate that the 2003 IG report calculated for non-detained asylum seekers. Without the 3 percent removal rate, the total, including the 602,000 unexecuted orders identified in 2002, was 1,143,867. The contradictory findings of DoJ’s unexecuted removal orders report in 2002 and ICE’s 2008 alien fugitive numbers cannot be reconciled. The higher figure is the more accurate because neither ICE (nor its predecessor INS), by its own admission, ever removed more than 34,155 aliens who were subject to final orders of removal in any year since 2003. In fact, more aliens outside detention were ordered removed each year after 2002 than ICE removed in any single year. This is not to say some did not return, adjust their presence in the US to a legal status or, in some instances, die, but no numbers suggest that the huge backlog of unexecuted orders can be explained away solely by these factors. The figure of 1.1 million is also supported by ICE’s announcement on August 18, 2009 that it would not remove aliens who skipped court or disobeyed orders to depart the U.S. This policy has caused an increase in unexecuted removal orders that builds on the 557,762 orders disclosed in 2008. See Anna Gorman, “Immigration Official Says Agents Will No Longer Have To Meet Quotas,” Los Angeles Times, August18, 2009, articles.latimes.com/2009/aug/18/local/me-immigration18. Said the story: “The head of Immigration and Customs Enforcement announced Monday in Los Angeles that he has ended quotas on a controversial program designed to go after illegal immigrants with outstanding deportation orders. This announcement came when teams of Immigration and Customs Enforcement (ICE) agents were expected to increase the number of annual arrests in the controversial fugitive operations’ program, according to agency memos.” Based on the courts’ history and the new ICE policy advising that aliens subject to final orders of removal who have no criminal convictions will not be removed, unexecuted removal orders at the end of 2009 equaled 1,109,551. 32 As much as 45 percent of the total unauthorized migrant population (approximately 12 million) entered the country with visas that allowed them to visit or reside in the United States for a limited amount of time. Known as “overstayers,” these migrants became part of the unauthorized population when they remained after their visas had expired. “Modes of Entry for the Unauthorized Migrant Population,” Pew Hispanic Center, May 22, 2006, pewhispanic.org/files/factsheets/19.pdf. 35 Jan C. Ting, “Immigration and National Security,” Orbis, vol. 50, no. 1, p.1 Winter 2005, Foreign Policy Research Institute, www.fpri.org/orbis/5001/ting.immigrationnationalsecurity.pdf. 36 8 C.F.R. §1003.10 (“Immigration judges. (a) Appointment. [I]mmigration judges are attorneys whom the Attorney General appoints as administrative judges within the Office of the Chief Immigration Judge to conduct specified classes of proceedings, including hearings under section 240 of the Act. Immigration judges shall act as the Attorney General’s delegates in the cases that come before them.”) See ecfr.gpoaccess.gov. 37 Once an alien has been ordered removed, DHS carries out the removal. EOIR does not maintain statistics on alien removals from the United States. EOIR 2007 Year Book, p. B1, www.justice.gov/eoir/statspub/fy07syb.pdf. 39 In “Chapters from My Autobiography” Twain confessed confusion. “Figures often beguile me,” he quipped, “particularly when I have the arranging of them myself; in which case the remark attributed to [British Prime Minister Benjamin] Disraeli would often apply with justice and force: There are three kinds of lies: lies, damned lies, and statistics.” Mark Twain, “Chapters from My Autobiography,” North American Review, No. DCXVIII, July 5, 1907. 40 Of the 1,913,507 aliens the United States permitted to remain free pending trial from 1996 through 2009, 40 percent of this number — 769,737 — never came to court. Composites for 5 year periods may be found in each year book. EOIR 2000 Year Book, p. L1-L2, Figures 15-17 and p. T1, Figure 23, www.justice.gov/eoir/statspub/fy00syb.pdf; EOIR 2004 Year Book, p. H1-H4, Figures 10-12 and p. O1, Figure 20, www.justice.gov/eoir/statspub/fy04syb.pdf; EOIR 2008 Year Book, p. H1-H4, Figures 10-12 and p. O1, Figure 23, www.justice.gov/eoir/statspub/fy08syb.pdf; EOIR 2009 Year Book, p. H1-H4, Figures 10-12 and p. O1, Figure 23, www.justice.gov/eoir/statspub/fy09syb.pdf. 42 A summons to appear in immigration courts is known as a “Notice to Appear.” It is issued by DHS to an alien who DHS charges is “removable” (i.e. deportable) from the United States. 43 See EOIR 2008 Year Book, p. H1- H4, Figures 10-12, and p. O1, Figure 23, www.justice.gov/eoir/statspub/fy08syb.pdf. Using the 5 year composite in the 2008 Year Book shows EOIR repeated its earlier finding that 39 percent of aliens failed to appear in court 2005. In fact, 59 percent were no-shows. In 2006, EOIR once more reported 39 percent of aliens made no court appearance. The real number was again 59 percent. 44 Composites for five-year periods may be found in each Year Book. See EOIR 2000 Yearbook, p. L1-L2, Figures 15-17 and T1, Figure 23, www.justice.gov/eoir/statspub/fy00syb.pdf; EOIR 2004 Year Book, p. H1-H4, Figures 10-12 and p. O1, Figure 20, www.justice.gov/eoir/statspub/fy04syb.pdf; EOIR 2008 Year Book, p. H1- H4, Figures 10-12 and p. O1, Figure 23, www.justice.gov/eoir/statspub/fy08syb.pdf; EOIR 2009 Year Book, p. H1-H4, Figures 10-12,.www.justice.gov/eoir/statspub/fy09syb.pdf. For 2009, 32 percent of alien litigants free pending court disappeared. EOIR reported the failure to appear rate was 11 percent. Total failures to appear equaled 33,209, while the total of aliens free pending court equaled 105,054. Dividing 33,209 by 105,054 shows that 32 percent of aliens failed to appear in court in 2009, nearly three times higher than the 11 percent as stated by EOIR. Failures to appear in 2009 did not decrease substantially as EOIR asserts. They remained consistent with failure to appear rates in 2007 and 2008 — 38 percent and 37 percent respectively. 47 From 1996 through 2009, trial courts issued removal orders in 2,279,234 cases. Of this total, 1,287,685 were issued against aliens in detention facilities. The balance of removal orders — 991,549 — were issued against aliens free pending their court dates. Removal orders were issued against 769,737 aliens who failed to appear in court and 221,707 aliens who kept their court dates but lost their trials. Put another way, 78 percent of all removal orders against those the U.S. allowed to remain free pending trial come from those who failed to keep their court dates, while 22 percent of removal orders are issued against those who followed orders to appear in court but lost their trials. See EOIR 2000 Year Book, p. I3, Table 12, p. L1—L2, Figures 1517, and p. T1, Figure 23, www.justice.gov/eoir/statspub/fy00syb.pdf; EOIR 2004 Year Book, p. D2, Figure 5, p. H1H4, Figures 1012, and p. O1, Figure 20, www.justice.gov/eoir/statspub/fy04syb.pdf; EOIR 2008 Year Book, p. D2, Figure 5, p. H1 H4, Figures 1012, and p. O1, Figure 23, www.justice.gov/eoir/statspub/fy08syb.pdf; EOIR 2009 Year Book, p. D2, Figure 5, p. H1 H4, Figures 1012, and p. O1, Figure 23, www.justice.gov/eoir/statspub/fy09syb.pdf. Department of Justice, FY 2008 Congressional Budget Submission, Administrative Review and Appeals, p. 2, 5. 51 “A key component of this effort is … the repair of the immigration system as a whole. More than ever, protecting America requires a multifaceted strategy which must include the effective coordination of investigative, enforcement, legal and adjudicative resources both within the Department and in concert with other agencies.” Department of Justice, FY 2009 Congressional Budget Submission, “Overview for Administrative Review and Appeals”, p. 1, www.justice.gov/jmd/2009justification/pdf/fy09-ara.pdf. 53 Between 2002 and 2006, 360,199 out of 713,974 non-detained aliens failed to keep their court dates, a total of 50.4 percent. See EOIR 2006 Year Book, p. H1-H4, Figures 10-12 and p. O1, Figure 20, www.justice.gov/eoir/statspub/fy06syb.pdf. 54 Composites for five-year periods may be found in each Year Book. EOIR 2000 Year Book, p. L1-L2, Figures 15-17, and p. T1, Figure 23, www.justice.gov/eoir/statspub/fy00syb.pdf; EOIR 2004 Year Book, p. H1-H4, Figures 10-12, and p. O1, Figure 20, www.justice.gov/eoir/statspub/fy04syb.pdf; EOIR 2008 Year Book, p. H1-H4, Figures 10-12, and p. O1, Figure 23, www.justice.gov/eoir/statspub/fy08syb.pdf; EOIR 2009 Year Book, p. H1-H4, Figures 10-12 and p. O1, Figure 23, www.justice.gov/eoir/statspub/fy09syb.pdf. 55 ICE Fiscal Year 2008 Annual Report, p.4, www.ice.gov/doclib/news/library/reports/annual-report/2008annual-report.pdf. (“At the end of 2008, there were 557,762 such [open fugitive] cases remaining.”) ICE has not reported its removal records for 2009 or 2010. Its August 2009 announcement that it would not remove aliens who skipped court or disobeyed orders to depart the U.S. has caused an increase in unexecuted removal orders that builds on the 557,762 orders disclosed in 2008. See Anna Gorman, “Immigration Official Says Agents Will No Longer Have To Meet Quotas,” Los Angeles Times, August18, 2009, articles.latimes.com/2009/aug/18/local/me-immigration18. 57 See EOIR 2009 Year Book, p. B1, www.justice.gov/eoir/statspub/fy09syb.pdf. 58 See EOIR 2009 Year Book, p. H1-H4, Figures 10-12 and p. O1, Figure 23, www.justice.gov/eoir/statspub/fy09syb.pdf. 59 See Note 31. Using previous reports from DHS and EOIR, the number of unexecuted orders of removal now equals 1,109,551. This number has increased 84 percent since 2002, when DoJ reported 602,000 orders against fugitive aliens remained unenforced. 61 In its annual Year Book EOIR features a highlights page — page A1 — with each report to Congress. With regard to failures to appear, the 2009 Year Book states: “The failure to appear rate decreased to 11 percent in FY 2009.” See p. H1-H4, Figure 10, www.justice.gov/eoir/statspub/fy09syb.pdf. 62 EOIR 2009 Year Book, p. H1-H4, Figures 10-12 and p. O1, Figure 20, www.justice.gov/eoir/statspub/fy08syb.pdf. The figure of 32 percent is calculated in this manner. EOIR reported 25,330 litigants free pending trial evaded court in 2009. EOIR excluded from its calculations cases administratively closed in 2009, essentially saying administrative closures — after 14 years — were no longer relevant. EOIR’s stated: “In previous years, administrative closures were included to calculate the failure to appear rate. However, due to a larger percentage of administrative closures not relating directly to failure to appear, the failure to appear rate is calculated using immigration judge decisions and in absentia orders only.” EOIR 2009 Year Book, p. H1, note to Figure 10. Rather than separate those cases not directly relating to failures to appear from those which directly related to failures to appear, EOIR chose the overbroad exclusion of all cases administratively closed. Therefore, administrative closures for 2009 are included by adding the 7,879 administrative closures obtained from TRAC Immigration at Syracuse University, which received these numbers through a Freedom of Information Act request. Failures to appear in 2009 thus equaled 33,209. The next step is to determine how many litigants were actually free pending trial. EOIR does not disclose this number. This number can be obtained, though, by taking the total number of non-detained aliens (76,492, see p. H2) and adding to it the total number of released aliens (20,683, see p. H3) and adding 7,879, the number of those free pending trial whose cases were administratively closed. The total sum of these numbers is 105,054. Dividing this total by those who failed to appear (33,482) shows that 32 percent of aliens failed to appear in court in 2009. 63 EOIR defines administrative closures in a glossary attached to its annual report. EOIR states: “Administrative closure of a case is used to temporarily remove the case from an immigration judge’s calendar or from the Board of Immigration Appeal’s docket. Administrative closure of a case does not result in a final order. It is merely an administrative convenience which allows the removal of cases from the calendar in appropriate situations. A case may not be administratively closed if opposed by either of the parties.” EOIR 2009 Year Book, “Appendix A - Glossary of Terms,” p.2, www.justice.gov/eoir/statspub/fy09syb.pdf. 64 EOIR 2000 Year Book, p. L1-L2, Figures 15-17 and p. T1, Figure 23, www.justice.gov/eoir/statspub/fy00syb.pdf; EOIR 2004 Year Book, p. H1-H4, Figures 10-12 and p. O1, Figure 20, www.justice.gov/eoir/statspub/fy04syb.pdf. 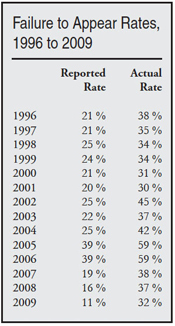 For the failure to appear rate from 1996 to 2001, see the table in note 44. 65 EOIR 2009 Year Book, p. N1, Figure 22, www.justice.gov/eoir/statspub/fy09syb.pdf. Applications or lawsuits completed in 2009 totaled 69,442. 66 Ibid. p. I1, Figure 13. Asylum applications completed in 2009 totaled 39,279. 67 Ibid. p. I2, Figure 14. Out of the 69,442 cases with applications, the courts completed 44,830 asylum applications in 2009. 68 Subtracting total asylum cases completed in 2009 (44,830) from total cases with applications that were completed in 2009 (69,442), leaves 24,612 cases that EOIR fails to explain. More than likely these cases make up the lawsuits EOIR calls “forms of relief other than asylum” found on page R3 of each fiscal year’s statistical Year Books. But this is guesswork. Nowhere does EOIR account for all the applications it receives from year to year. 70 Margaret E. Martin, Miron L Straf, and Constance F. Citro, eds., Principles and Practices for A Federal Statistical Agency, 3rd ed., National Academies Press, 2005, p.3, available at, books.nap.edu/openbook/0309095999/html/index.html. The National Research Council’s mission “is to improve government decision making and public policy, increase public education and understanding, and promote the acquisition and dissemination of knowledge in matters involving science, engineering, technology, and health. The institution takes this charge seriously and works to inform policies and actions that have the power to improve the lives of people in the U.S. and around the world.” See sites.nationalacademies.org/NRC/index.htm. 73 See Pam Meister, “Our Broken Immigration System,” Big Government, December 17, 2009, biggovernment.com/pmeister/2009/12/17/our-broken-immigration-system-penalizing-those-who-follow-the-rules/. 76 While a judge on the immigration court, the author noted that a significant number of cancellation actions involved men and women whose past lives included low-grade or harmless criminal violations which years later prompted their being summoned to court or, in other cases, were used as evidence of a criminal past. Though relevant, standing alone they were often insufficient to order an alien removed. Authentic judicial authority and statutory amendments are needed to address such cases, which frequently take a disproportionate amount of time that could be avoided by increasing authority in judges. More powerful courts — courts that maintain jurisdiction throughout the life of a case — would help eliminate the backlogs caused by these cases. 78 ICE Fiscal Year 2008 Annual Report, U.S. Immigration and Customs Enforcement, p. 3-4, www.ice.gov/doclib/news/library/reports/annual-report/2008annual-report.pdf. 82 See EOIR 2000 Year Book, p. I2-I3, Figure 12, www.justice.gov/eoir/statspub/fy00syb.pdf, and EOIR 2001 Year Book, p. I2-I3, Figure 12, www.justice.gov/eoir/statspub/fy01syb.pdf. These reports affirm a fairly consistent pattern of courts ordering removal approximately 80 percent of the time. Across the last 14 years removal orders maintain this average. In 1996, 82 percent of aliens appearing in immigration courts were ordered deported and 83 percent were ordered deported in 1997. In 2000, 79 percent were ordered removed and in 2001the number dropped only slightly to 78 percent. Orders granting relief to aliens average about 13 percent across the same 14 years and termination orders round out the balance of orders at an average of 7 percent. Seldom, however, is anyone ever removed. 83 Through the last 14 years, trial courts made decisions in 2,857,390 cases. EOIR routinely advises Congress that removal orders compose 80 percent of all decisions. See EOIR 2000 Year Book, p. I2, Table 12, www.justice.gov/eoir/statspub/fy00syb.pdf; EOIR 2004 Year Book, p. D1, Figure 4, www.justice.gov/eoir/statspub/fy04syb.pdf; EOIR 2008 Year Book, p. D1, Figure 4, www.justice.gov/eoir/statspub/fy08syb.pdf; EOIR 2009 Year Book, p. D1, Figure 4, www.justice.gov/eoir/statspub/fy09syb.pdf. Calculated this way, trial courts granted relief — in other words permission to remain in the United States — in 13 percent of all decisions. These grants totaled 383,355 decisions. EOIR 2000 Year Book, p. I2, Table 12; EOIR 2004 Year Book, p. D2, Figure 5; EOIR 2008 Year Book, p. D2, Figure 5; EOIR 2009 Year Book, p. D2, Figure 5. The rest of the courts’ work involved what are called “termination orders” and unspecified “others.” See EOIR 2000 Year Book, p. I3, Table 12; EOIR 2004 Year Book, p. D2, Figure 5; EOIR 2008 Year Book, p. D2, Figure 5. A termination is a type of completion in which a case is closed by a trial court or the Board of Immigration Appeals without a final order of removal or deportation. A case is terminated when the respondent is found not removable as DHS originally charged. The alien can always be charged again. These cases equaled 7 percent or 201,173 of all court decisions. 84 Between 2000 and 2009, trial courts granted relief in 295,617 applications out of the 486,032 applications that were actually decided “on the merits” — in other words, decisions on whether an alien would remain in the United States or be deported. Over the last 10 years, the courts completed 756,189 lawsuits filed by aliens. Of these applications, 270,157 were abandoned, withdrawn or transferred prior to trial. This left 486,032 cases which that were actually tried. Trial courts ruled in favor aliens in 295,617 of these cases. Verdicts in favor of aliens included asylum cases with 137,322 grants, withholding and deferral cases under the Conventions Against Torture with 5,238 grants, and relief granted in 212(c) waivers, suspension of deportation, adjustment and cancellation cases for both lawful and non-lawful permanent residents with 153,057 grants. See EOIR 2004 Year Book, p. D2, Figure 5, p. K4, Figure 19, p. M1, Table 9, p.N1, Figure 22, and R3, Table 15, www.justice.gov/eoir/statspub/fy04syb.pdf; EOIR 2008 Year Book, p. D2, Figure 5, p.K4, Figure 19, p. M1, Table 9, p. N1, Figure 22, p. R3, Table 15, www.justice.gov/eoir/statspub/fy08syb.pdf; EOIR 2009 Year Book, p. D2, Figure 5, p. K4, Figure 19, p. M1, Table 9, p. N1, Figure 22, and p. R3, Table 15, www.justice.gov/eoir/statspub/fy09syb.pdf. Aliens outside detention file the vast majority of lawsuits, while aliens in detention typically accept orders of removal, filing applications for relief much less often. This distinction is critical because of its “downstream” effect regarding appeals. Only aliens who file lawsuits can later appeal orders of deportation. 85 Trial courts considered 756,189 applications for relief from 2000 through 2009. 295,617 of these applications received grants. See EOIR 2004 Year Book, p. N1, Figure 22, www.justice.gov/eoir/statspub/fy04syb.pdf; EOIR 2008 Year Book, p. N1, Figure 22, www.justice.gov/eoir/statspub/fy08syb.pdf; EOIR 2009 Year Book, p. N1, Figure 22, www.justice.gov/eoir/statspub/fy09syb.pdf. 86 From 2000 through 2009, the courts made decisions in 2,655,549 cases, but only 2,124,022 cases had decisions involving grants and denials of relief. Aliens filed no applications for relief in 1,691,843 of the cases. Applications for relief were filed in 486,032 of these decisions, while in 295,617of these same applications aliens received relief. See EOIR 2004 Year Book, p. D1-D2, Figures 4 and 5, p. K4, Figure 19, p. M1, Table 9, p. N1, Figure 22, p. Q1, Table 15, and p. R3, Table 15, www.justice.gov/eoir/statspub/fy04syb.pdf; EOIR 2008 Year Book, p. D1-D2, Figures 4 and 5, p. K4, Figure 19, p. M1, Table 9, p. N1, Figure 22, p. Q1, Table 15, and p. R3, Table 15, www.justice.gov/eoir/statspub/fy08syb.pdf; EOIR 2009 Year Book, p. D1-D2, Figures 4 and 5,p. K4, Figure 19, p. M1, Table 9, p. N1, Figure 22, p. Q1, Table 15, and p. R3, Table 15, www.justice.gov/eoir/statspub/fy09syb.pdf. 87 An alien who does not file a lawsuit or an application to remain in the United States usually does so when he or she advises a trial court that they have no grounds upon which to seek asylum and have no significant enough personal connections to the U.S. to enable the filing of an adjustment or cancellation application. 88 The courts issued a total of 218,589 removal orders involving applications over the last 10 fiscal years, 167,559 asylum denials, and 51,030 denials chiefly involved adjustment and cancellation matters, (forms of relief available to lawful and non-lawful residents, but not to those seeking asylum). From 2000 through 2009, 204,096 applications were filed by aliens seeking these forms of relief available to lawful and non-lawful residents. Trial courts granted 153,057 of these applications and denied 51,030 of them. Grant rates for these forms of relief equal 75 percent since 2000. For verification see EOIR 2004 Year Book, p. N1, Figure 22, p. I2, Figure 14, and p. R3, Table 15, www.justice.gov/eoir/statspub/fy04syb.pdf; EOIR 2008 Year Book, p. N1, Figure 22, p. I2, Figure 14, and p. R3, Table 15, www.justice.gov/eoir/statspub/fy08syb.pdf; EOIR 2009 Year Book, p. N1, Figure 22, p. I2, Table 14, and p. R3, Table 15, www.justice.gov/eoir/statspub/fy09syb.pdf. 90 EOIR 2009 Year Book, p. Y1, Figure 32 and p. N1, Figure 22, www.justice.gov/eoir/statspub/fy09syb.pdf. In FY 2009, EOIR reported 8 percent of trial court decisions were appealed to the BIA. What EOIR critically failed to add was that only 69,442 cases out of the 290,233 cases that trial courts considered actually had applications for relief. Stated differently, 76 percent of all cases trial courts decided had no applications to consider. And without a lawsuit or application to rule upon, there could be no judgments favoring aliens and no appeals in the event applications were denied. 91 EOIR 2004 Year Book, p. K3, Figure 19, www.justice.gov/eoir/statspub/fy04syb.pdf; EOIR 2008 Year Book, p. K3, Figure 19, www.justice.gov/eoir/statspub/fy08syb.pdf; EOIR 2009 Year Book, p. K3, Figure 19, www.justice.gov/eoir/statspub/fy09syb.pdf. From 2000 through 2009, aliens appealed 214,404 out of 218,589 removal decisions issued by trial courts or 98 percent of all removal decisions. Over this same period, aliens filed approximately 756,189 applications for relief. Overall, aliens appealed 28 percent of all applications filed with the court and 98 percent of all removal orders that included an application for relief. 92 EOIR 2009 Year Book, p. Y1, Figure 32, www.justice.gov/eoir/statspub/fy09syb.pdf. In FY 2009, 8 percent of trial court decisions were appealed to the BIA. 93 EOIR 2004 Year Book, p. Y1, Figure 32, www.justice.gov/eoir/statspub/fy04syb.pdf. In FY 2003, EOIR stated that aliens appealed 17 percent of all trial court decisions, neglecting to add that only cases in which applications are filed can be appealed. In the same year, 33,652 aliens with applications for relief actually appealed denial or removal orders out of a total 46,650 removal orders, or 72 percent of all removal orders in which an application for relief was filed. 94 EOIR 2008 Year Book, p. Y1, Figure 32, www.justice.gov/eoir/statspub/fy08fyb.pdf. Only 9 percent of trial decisions were appealed by aliens in 2008 (20,670 out of 229, 316 decisions). Only 10 percent were appealed in 2007 (21,847 out of 222,618 decisions). 95 See United States v. Ramos, 623 F.3d 672 (9th Cir. 2010). Ramos had stipulated his removability before an immigration judge and, despite there being problems with the stipulation, the Ninth Circuit court held that no relief was available to Ramos. As a result, the removal order was affirmed. Also see 8 U.S.C. § 1229a(d). An immigration judge’s ability to enter stipulated removal orders “facilitates judicial efficiency in uncontested cases” and serves to “alleviate overcrowded federal, state, and local detention facilities.” Stipulated Requests for Deportation or Exclusion Orders, 59 Fed.Reg. 24,976 (May 13, 1994). See also Inspection and Expedited Removal of Aliens, 62 Fed.Reg. 10,312, 10,321-22 (Mar. 6, 1997). 8 C.F.R. § 1003.25 provides an immigration judge with discretion to “enter an order of deportation, exclusion or removal stipulated to by the alien (or the alien’s representative) and the Service.” The amended regulation, however, permits an immigration judge to enter stipulated orders of removal for aliens without legal representation, and requires that the stipulation include: (1) An admission that all factual allegations contained in the charging document are true and correct as written; (2) A concession of deportability or inadmissibility as charged; (3) A statement that the alien makes no application for relief under the [Immigration and Nationality] Act; (4) A designation of a country for deportation or removal under section 241(b)(2)(A)(i) of the Act; (5) A concession to the introduction of the written stipulation of the alien as an exhibit to the Record of Proceeding; (6) A statement that the alien understands the consequences of the stipulated request and that the alien enters the request voluntarily, knowingly, and intelligently; (7) A statement that the alien will accept a written order for his or her deportation, exclusion or removal as a final disposition of the proceedings; and (8) A waiver of appeal of the written order of deportation or removal. 8 C.F.R. § 1003.25. 96 The INS interior enforcement strategy, issued in 1999 and adopted by DHS, developed priorities for enforcement efforts. The first priority is the detention and removal of criminal aliens. The second is the dismantling and diminishing of alien smuggling and trafficking operations. The third addresses responding to community complaints about illegal immigration including those of law enforcement. The fourth priority regards investigating and prosecuting immigrant benefit and document fraud. The fifth involves deterrence of employers’ use of unauthorized aliens. Overall, the strategy aims to deter illegal immigration, prevent immigration related crimes, and remove those illegally in the United States. Congressional Research Service, “Immigration Enforcement Within the United States,” p.7, April 6, 2006, www.fas.org/sgp/crs/misc/RL33351.pdf. Nowhere in the “Interior Enforcement Strategy” are immigration courts or enforcing their removal orders mentioned. 98 Edward R. Grant, “Symposium on Immigration Appeals and Judicial Review,” Catholic University Law Review, 55 Cath.U.L.Rev. 923, p. 2, Summer 2006. A 2003 DoJ Inspector General’s Report, the report to which Judge Grant referred at the symposium, found that only 3 percent of failed asylum-seekers were actually deported. 101 Mizanur Rahman, “ICE: We Are Not Engaged In A ‘Backdoor’ Amnesty,” Immigration Chronicles, Chron.com, Aug. 26, 2011, blogs.chron.com/immigration/archives/2010/08/post_443.html. 102 EOIR 2008 Year Book, p. P2, Table 13, www.justice.gov/eoir/statspub/fy08syb.pdf. Decisions by judges in penal institutions in 2008 resulted in 95.7 percent of aliens ordered removed at completion of their sentences. States the annual report: “The goal of the IHP [Institutional Hearing Program] is to complete proceedings for incarcerated criminal aliens serving federal or state sentences prior to their release from prison or jail. This allows DHS to remove aliens with final removal orders expeditiously at the time of their release from incarceration.” Ibid. p. P1. 103 In summary, DHS apprehended more than 1,206,000 foreign nationals in 2006. Nearly 88 percent were natives of Mexico. There were 8,778 ICE Office of Investigations criminal arrests and 6,872 convictions for immigration-related crimes. ICE detained approximately 257,000 foreign nationals and removed 272,389 aliens from the United States. The leading countries of origin of those removed were Mexico (67 percent), Honduras (10 percent), and Guatemala (7 percent). More than 1,043,000 other foreign nationals accepted an offer to return to their home countries without a removal order. Office of Immigration Statistics, Department of Homeland Security, “Immigration Enforcement Actions: 2006,”Annual Report, May 2008, p.1, www.dhs.gov/xlibrary/assets/statistics/publications/enforcement_ar_06.pdf. 105 From 1996 through 2009, trial courts issued removal orders in 2,279,234 cases. Of this total, 1,287,685 were issued against aliens in detention facilities. The balance of removal orders — 991,549 — were issued against aliens free pending their court dates, 769,842 against aliens who failed to appear in court and 221,707 against those who kept their court dates but lost their trials. Put another way, 78 percent of all removal orders against those the U.S. allowed to remain come from those who failed to keep their court dates, while 22 percent of removal orders are issued against those who followed orders to appear in court but lost their trials. See EOIR 2000 Year Book, p. I3, Table 12, p. L1L2, Figures 15—17 and p. T1, Figure 23, www.justice.gov/eoir/statspub/fy00syb.pdf; EOIR 2004 Year Book, p. D2, Figure 5, p. H1H4, Figures 10—12 and p. O1, Figure 20, www.justice.gov/eoir/statspub/fy04syb.pdf; EOIR 2008 Year Book, p. D2, Figure 5, p. H1H4, Figures 1012, and p. O1, Figure 23, www.justice.gov/eoir/statspub/fy08syb.pdf; EOIR 2009 Year Book, p. D2, Figure 5, p. H1—H4, Figures 10—12, and p. O1, Figure 23, www.justice.gov/eoir/statspub/fy09syb.pdf. 106 “ICE Total Removals,” December 7, 2010, www.ice.gov/doclib/about/offices/ero/pdf/ero-removals.pdf. 108 “ICE Total Removals,” December 7, 2010, www.ice.gov/doclib/about/offices/ero/pdf/ero-removals.pdf. ICE noted that removals include those who voluntarily departed or who voluntarily returned. 112 Susan Carroll, “Feds Moving To Dismiss Some Deportation Cases,” Houston Chronicle, August 24, 2010, www.chron.com/disp/story.mpl/special/immigration/7169978.html. 113 Testimony of Barbara Jordan, Chair, U.S. Commission on Immigration Reform, Before the U.S. House of Representatives Committee on the Judiciary, Subcommittee on Immigration and Claims, Feb. 24, 1995, available at www.utexas.edu/lbj/uscir/022495.html. The late Barbara Jordan was a democratic congresswoman from Texas. 114 The INS interior enforcement strategy, issued in 1999 and adopted by DHS, developed priorities for enforcement efforts. The first priority is the detention and removal of criminal aliens. The second is the dismantling and diminishing of alien smuggling and trafficking operations. The third addresses responding to community complaints about illegal immigration including those of law enforcement. The fourth priority regards investigating and prosecuting immigrant benefit and document fraud. The fifth involves deterrence of employers’ use of unauthorized aliens. Overall, the strategy aimed to deter illegal immigration, prevent immigration related crimes, and remove those illegally in the United States. See Congressional Research Service, “Immigration Enforcement Within the United States,” p.7, April 6, 2006, www.fas.org/sgp/crs/misc/RL33351.pdf. Nowhere in the “Interior Enforcement Strategy” are immigration courts or enforcement of removal orders mentioned. 116 “Play court” is a term used by some judges to express frustration with orders that are never enforced and with processes that mimic traditional courts, but lack judicial authority to give them effect. 117 See Office of Inspector General, Department of Homeland Security, “Detention and Removal of Illegal Aliens,” Audit Report OIG-06-33, p.2 April 2006, www.dhs.gov/xoig/assets/mgmtrpts/OIG_06-33_Apr06.pdf. 118 ICE Fiscal Year 2008 Annual Report, U.S. Immigration and Customs Enforcement, p. 4, www.ice.gov/doclib/news/library/reports/annual-report/2008annual-report.pdf. 125 The Worldwide Threat: Hearing Before the Senate Select Comm. on Intelligence, 109th Cong., Feb. 16, 2005, (testimony of Admiral James C. Loy, Deputy Secretary of Homeland Security), http://www.fas.org/irp/congress/2005_hr/021605loy.pdf. 126 Ten Years After 9/11: A Report from the 9/11 Commission Chairmen, Hearing before the Senate Committee on Homeland Security and Governmental Affairs, March 30, 2011 (Testimony of Gov. Tom Kean and Rep. Lee Hamilton), available at hsgac.senate.gov/public/index.cfm?FuseAction=Hearings.Hearing&Hearing_ID=759efc68-191f-4dfd-b362-c3197c6cb62. 127 Surin & Griffin, P.C., “Deportation and Asylum Assistance in Immigration,” www.msgimmigration.com/deportation-asylum/.This law firm’s narrative provides a realistic assessment: “It is difficult to predict how long a contested removal case can take to resolve. However, removal cases for non-detained clients often take more than a year to conclude. If there is an appeal to the Board of Immigration Appeals, cases frequently take another year or two.” While on the Miami Immigration Court, the author encountered cases coming to court years after the summons (a document called a Notice to Appear) had been issued. One case the author resolved was 14 years old. Immigration judges from across the United States frequently have the same experience. 128 TRAC Immigration, “Immigration Case Backlog Still Growing,” trac.syr.edu/immigration/reports/232/. The report finds that the average time that pending cases wait in the trial courts is now 443 days. Wait times continue to be longest in California, at 627 days. 129 Lecturers at judicial training conferences frequently addressed time frames for considering cases. One-and-a-half-hour to three-hour hearings were suggested, but thoroughness was emphasized over time considerations. Most cases heard in the Miami court fit this model. Still, there were many exceptions. 130 Surin & Griffin, P.C., “Deportation and Asylum Assistance in Immigration,” www.msgimmigration.com/deportation-asylum/. See also Ken Reitz, “Panel Discusses Challenges in Immigration Court System,” University of Virginia, March 28, 2008, www.law.virginia.edu/html/news/2008_spr/immigration_judges.htm. Judge Osuna of the Board of Immigration Appeals was quoted as saying that while it used to take four or five years for a case to be decided, it’s now usually eight to 18 months; TRAC Immigration, “Case Backlogs in Immigration Courts Expand, Resulting Wait Times Grow,” Figure 1, June 17, 2009, trac.syr.edu/immigration/reports/208/. TRAC noted that “EOIR did not dispute TRAC’s figures, nor challenge the fact that pending case backlogs were growing and wait times were increasing. Specifically, EOIR did not dispute an 11-year backlog.” If a case is appealed to a circuit court, concluding it will take at least another year. Altogether, five years from the time a case starts to the time it is finished is not unusual. 131 Board of Immigration Appeals. This panel is the appellate body that hears appeals from the immigration trial courts. 132 Office of Management and Budget, “Detailed Information on the Immigration Adjudication Assessment,” ExpectMore.gov, www.whitehouse.gov/omb/expectmore/detail/10003809.2006.html. This is an updated assessment from 2006 that reveals 161,112 cases were pending in 2003. It further shows that 92 percent of expedited asylum cases were processed within the 180-day deadline in 2005, 95 percent in 2006, 90 percent in 2007 and 80 percent in 2008. Congress was not provided this same information in EOIR’s Statistical Year Book in any of these years. 133 Office of Management and Budget, the largest agency in the Executive Office of the President, helps sets management, planning and budgeting priorities for the federal government. See omb.gov. 134 Office of Management and Budget, “Detailed Information on the Immigration Adjudication Assessment,” ExpectMore.gov, www.whitehouse.gov/omb/expectmore/detail/10003809.2006.html. 135 TRAC Immigration, “Case Backlogs in Immigration Courts Expand, Resulting Wait Times Grow,” June 17, 2009, trac.syr.edu/immigration/reports/208/. TRAC revealed 201,212 cases were backlogged and the backlog was apparently never reported to the White House, the Department of Justice, Congress, or the public. 136 Ibid. Stated the article: “A detailed study of the recent performance of the Immigration Courts — undertaken by the Transactional Records Access Clearinghouse (TRAC) — draws upon a variety of sources including hundreds of thousands of internal administrative records obtained from EOIR under the Freedom of Information Act. The key conclusion: the failure of the Justice Department even to fill existing judge vacancies, combined with growth in the number of matters the judges are handling each year, has exacted some very real costs … The backlog of immigration cases awaiting disposal by judges is steadily increasing. Just since the end of FY 2006 this backlog has grown by 19 percent. And over the past decade, the backlog of cases has increased by 64 percent.” The backlog TRAC identifies stretched back to 1998 when unfinished cases then numbered 129,482. The 64 percent growth rate is the change from 129,482 to 201,212. How this number can be reconciled with OMB’s declaration that 3,965 cases remained backlogged in 2008 from a batch numbering 161,112 in 2003 is not clear without more information. Two things are certain, though. Neither Congress nor the public were informed of the backlog prior to the TRAC study. Likewise, the backlog has a history indicating some cases were 11 years old when the study was published on June 19, 2009. 138 TRAC Immigration, “As FY 2010 Ends, Immigration Case Backlog Still Growing,” October 2010, trac.syr.edu/immigration/reports/242/. States the article: “The number of cases awaiting resolution before the Immigration Courts reached a new all-time high of 261,083 by the end of September 2010, according to very timely government enforcement data obtained by the Transactional Records Access Clearinghouse (TRAC). The case backlog has continued to grow — up 5.3 percent — since TRAC’s last report three months ago, and more than a third higher (40 percent) than levels at the end of FY 2008.” See also Marcia Coyle, “Immigration Courts’ Backlog Hits New High,” National Law Journal, May 25, 2009. States the article: “The backlog of immigration cases facing the nation’s immigration courts reached a new high at the end of March — 242,776 cases — up 6.3 percent from four months ago, and 30.4 percent from 18 months ago. TRAC released the study which also shows that waiting times continue to lengthen. The average time that pending cases have been in the immigration courts is now 443 days. TRAC said the backlog of cases is driven by several factors. The main factor is the number of judges available overall and in particular localities. Other important factors include the complexity of the cases and changes in enforcement strategies at the DHS.” See also TRAC Immigration, “Immigration Case Backlog Still Growing,” May 2010, trac.syr.edu/immigration/reports/232. 139 See American Bar Association Appellate Standard 3.52. This rule requires 75 percent of all cases appealed to an intermediate appellate court to be determined within 290 days of the filing of the Notice of Appeal, 95 percent should be determined within one year, and the remaining 5 percent are to be determined as soon as possible after one year. Well established precedent holds that failure to determine an appellate matter within years years from Notice of Appeal is a presumptive denial of due process. “[A]n appeal that is inordinately delayed is as much a ‘meaningless ritual’ as an appeal that is adjudicated without the benefit of effective counsel or a transcript of the trial court proceedings.” United States v. Smith, 94 F.3d 204 (6th Cir. 1996). 140 Margaret Tebo, “Asylum Ordeals,” ABA Journal, November 2006, www.abajournal.com/magazine/article/asylum_ordeals/. States the article: “The number of immigration cases appealed to the BIA each year more than doubled during the ‘90s, resulting in a backlog of more than 60,000 cases by 2000.” See Dorsey & Whitney LLP, Board of Immigration Appeals: Procedural Reforms to Improve Case Management, Appendix 12, 2003, http://www.dorsey.com/Resources/Detail.aspx?pub=144. In 2003, the ABA commissioned Dorsey & Whitney to report on the continuing backlog in resolution of immigration cases. The report notes that in 1999 the BIA streamlined its review process, allowing single member review of some cases, instead of the traditional three member panel. Attorney General Ashcroft streamlined the appeals process even further and substantially reduced the backlog. In turn, the circuit courts of appeal saw immigration appeals increase more than 600 percent. Jonathan Cohn, DoJ’s Deputy Assistant Attorney General for the Civil Division, told lawmakers in April 2006 that the number of board decisions appealed to federal courts between 2001 and 2005 rose by 603 percent, from 1,757 cases to 12,349 cases. See also Katherine McIntire Peters, “Justice Overwhelmed”, Government Executive, July 15, 2006, http://www.govexec.com/features/0706-15/0706-15s3.htm. 141 Ken Reitz, “Panel Discusses Challenges in Immigration Court System,” University of Virginia, March 28, 2008, www.law.virginia.edu/html/news/2008_spr/immigration_judges.htm. Judge Osuna of the Board of Immigration Appeals was quoted as saying that while it used to take four or five years for a case to be decided, it’s now usually eight to 18 months. Federal circuit courts took notice. In United States v. Lopez-Velasquez, 568 F.3d 1139 (9th Cir. 2009), the Ninth Circuit observed the BIA appeal process took a long time and cases “routinely remained pending [before the BIA] for more than two years, and some [had] taken more than five years to resolve.” See also Board of Immigration Appeals: Procedural Reforms to Improve Case Management, 67 Fed. Reg. 54,878 - 54,905 (Aug. 26, 2002). 142 See EOIR 2009 Year Book, p. U1, Figure 28. The reported BIA backlog is 27,969 cases. www.justice.gov/eoir/statspub/fy09syb.pdf. 143 Federal spending increased 276 percent between 1990 and 2010. In 1990 the spending of the U.S. government was $1.253 trillion. The 2010 outlays totaled $3.456 trillion. Office of Management and Budget, Historical Table 15.2, “Total Government Expenditures 1948 — 2010,” www.whitehouse.gov/omb/budget/Historicals. 144 See “Inflation Rate Calculator,” InflationData.com, inflationdata.com/Inflation/Inflation_Calculators/Inflation_Rate_Calculator.asp. The inflation rate calculated from January 1990 to January 2010 is 70.08 percent. 145 In FY 1990, the immigration courts received $36.2 million. Department of Justice, “Budget Trend Data,” p. 33, Spring 2002, www.justice.gov/archive/jmd/1975_2002/btd02tocpg.htm. In 2010, courts received $298 million. U.S. Department of Justice, “FY2011 Budget and Performance Summary,” Part 2, Executive Office of Immigration Review, www.justice.gov/jmd/2011summary/html/fy11-eoir-bud-summary.htm. This expansion in funding constitutes a growth rate of 823 percent. 146 Between 2000 and 2007, EOIR spent just less than $30 million to produce appellate transcripts for alien litigants. During this period, EOIR contracted transcription services chiefly through three court reporting services, Free State Reporting, York Stenographic Services and Deposition Services. See www.fbodaily.com/archive/2006/10October/01Oct2006/FBO01158532.htm (Contract Award No. DJJ-07-C-1478/1479/1480 dated September 29, 2006). Between 2000 and 2008, EOIR spent $33,844,717 to produce appellate transcripts for private litigants. The largest part of this amount — altogether $29,176,481 — were tax dollars. From 2000 through 2008, EOIR paid Free State Reporting $14,304,667. From 2000 through 2008, EOIR paid York Stenographic Services $2,101,308. From 2000 through 2008, EOIR paid Deposition Services $12,770,506. For a year by year breakdown visit www.usaspending.gov. Search under contracts, using names of the contractors. EOIR contracted through Department of Justice, Justice Management Division, Procurement Services Staff (PSS). The “identifier” or identifying number is 1501, the numeric code for “Offices, Boards and Divisions (includes Attorney General, etc. ).” The contracts are 1478, 1479 and 1480 as of the last contract awarded on September 29, 2006. On average EOIR spent $3,760,538 per year from taxes to pay for private litigation. When court personnel time is factored into total agency cost (a factor of 16 percent as provided in a 2000 court study), another $4,668,369 was spent in processing appeals. A $4 million transfer from DHS to DoJ placed in EOIR’s account since 2008 addresses tax dollars used to pay for alien appellate transcripts. The 2008 Budget Summary states “Fees collected for the processing of immigration appeal documents are deposited into the Immigration Examinations Fee Account, which is collected by the Department of Homeland Security. In FY 2008 [and 2009 and 2010], EOIR received $4,000,000 [$12 million altogether] as a transfer from the Immigration Examinations Fee Account.” Department of Justice 2008 Budget Summary, Administrative Review and Appeals, www.justice.gov/jmd/2008summary/pdf/061_ara.pdf; see also Department of Justice 2010 Budget Summary, Administrative Review and Appeals, p. 38, www.justice.gov/jmd/2010summary/pdf/eoir-bud-summary.pdf; and Department of Justice 2009 Budget Summary, Administrative Review and Appeals, www.justice.gov/jmd/2009summary/pdf/ara-component-summary.pdf. 147 Cancellation actions involving aliens who have committed crimes in the United States and cases in which a court determines that an alien’s marriage to a U.S. citizen is fraudulent (an “adjustment” case) do not require the alien to pay court costs — the cost of the transcript — if the alien appeals an order of removal. Aliens in immigration courts are treated remarkably better than citizens and non-citizens in other state and federal courts through the country who in civil matters are required to pay their own court costs. 148 Operations of the Executive Office for Immigration Review, Hearing before the Subcommittee On Immigration and Claims of the Committee on the Judiciary, H. of Rep., 107th Congress, Second Session, Feb. 6, 2002, p. 37, 45, (testimony of Hon. Michael Heilman), commdocs.house.gov/committees/judiciary/hju77558.000/hju77558_0f.htm. 151 See 5 CFR § 9701.601—710 and 73 Fed. Reg. 76914, Thursday, December 18, 2008, www.justice.gov/eoir/vll/fedreg/2008_2009/fr18dec08c.pdf. States EOIR: “In fact, DHS has adopted a formal disciplinary process for its employees that provides similar hearing and appeal rights as EOIR’s practitioner disciplinary process, including removal or suspension from employment. See 5 CFR 9701.601—710.” 73 Fed. Reg. at 76,917. 152 Barbara W. Tuchman, The March of Folly, New York: Alfred A. Knopf, Inc., 1984, p. 7. 156 A legislative or Article I court is created in furtherance of the powers reserved to Congress by the Constitution. American Insurance Co. v. Canter, 26 U.S. (1 Pet.) 511 (1828). 157 Approximately 65,033 immigrants serve in the armed forces. As of February 2008, there were 65,033 foreign-born individuals on active duty in the U.S. military, both naturalized citizens and noncitizens. This number includes both naturalized citizens and noncitizens. More than two-thirds of the foreign-born serving in the Armed Forces are naturalized citizens. The 44,705 members of the U.S. Armed Forces who were naturalized citizens in February 2008 represent 68.7 percent of the 65,033 foreign-born serving in the U.S. military. The 20,328 non-citizen members account for 31.3 percent of the total. The share of naturalized members on active duty has increased since May 2006, when it was 51.3 percent (or 35,262) of the 68,711 foreign-born military personnel. The foreign born represented 4.8 percent of the 1.36 million active-duty personnel in the Armed Forces as of February 2008. Jeanne Batalova, “Immigrants in the U.S. Armed Forces,” Migration Policy Institute, www.migrationinformation.org/USfocus/display.cfm?id=683#3. 159 Matthew Pinsker, Lincoln’s Sanctuary: Abraham Lincoln and the Soldier’s Home, New York: Oxford University Press 2003, p. 172. Writes Pinsker, “[A]bout 24 percent of the Union Army during this period was foreign-born.” Pinsker’s conclusions are drawn from the Quarterly Reports of Inmates [at the Soldier’s Home], Entry 18, Record Group 231, National Archives, Washington, DC. Other estimates say almost 25 percent of Union soldiers were foreign-born. See Union Army, Ethnic Groups, at www.absoluteastronomy.com/topics/Union_Army. Lincoln signed legislation approving the Congressional Medal of Honor on July 12, 1862. 161 John Reiniers, “La Reconquista—The Politics of Ethnic Conflict,” Hernando Today, May 23, 2010, www2.hernandotoday.com/content/2010/may/23/la-reconquista-politics-ethnic-conflict/. States the author: “Many Mexican immigrants, legal or otherwise, see themselves as part of a process of retaking the United States that once was a part of Mexico. Recent Mexican law permits dual citizenship which tacitly supports this notion.